A top army commander on Sunday disclosed that 190 militants were killed by the security forces in Kashmir this year so far and 200 were still active. SRINAGAR: A top army commander on Sunday disclosed that 190 militants were killed by the security forces in Kashmir this year so far and 200 were still active, apart from asserting that these killings have resulted in a remarkable change in the valley's law and order situation. “About 190 militants have been killed in encounters with security forces in Valley this year so far,” General Officer Commanding (GoC) of Army’s Srinagar-based 15 Corps, Lt Gen J S Sandhu, said while addressing a joint press conference with local police and CRPF officials at army headquarters, here. He said that out of the above 190 dead militants, 110 were foreigners and 80 were locals. “Out of 110 foreign militants, 66 were killed at Line of Control (LoC) while trying to sneak into this side,” the GoC remarked. He also added that 125-130 militants have been killed in the Kashmir hinterland. About a dozen top militant commanders have been killed in the security forces' operations this year. The agitation that was seen in the Valley state in early part of this year has been brought under control, Sandhu further added. 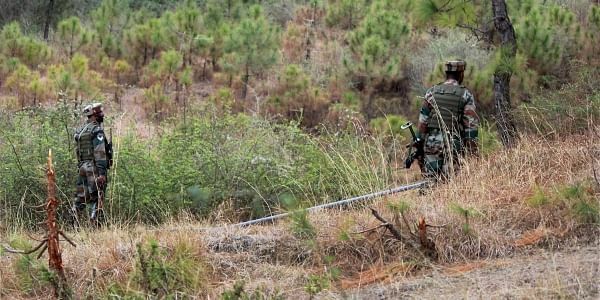 On Saturday’s encounter in Hajin area of north Kashmir’s Bandipora district, in which six Lashkar-e-Toiba militants and an IAF Garud commando were killed, GoC said, “Hajin was an area of focus for us. Many militants were killed early this year in the area but the militants had revived their activities and killed many people including a former counter insurgent Rashid Billa and off-duty BSF jawan Ramzan Parray”. “We launched combing operations in Hajin area from last month on daily basis. We had inducted special forces in the area and police, CRPF and army men worked together and brought law and order in the area under control,” the GoC said while adding that Chandergeer, yesterday's encounter venue, was under the radar of security forces. “On specific information, security personnel launched an operation and killed six Pakistani militants of Lashkar led by Mehmood Bhai,” Sandhu remarked. Among the deceased militants was Osama Jangi alias Obaid. He is the nephew of Mumbai attacks mastermind Zaki-ur-Rehman Lakhvi and son of Makki-ur-Rehman Lakhvi, Lashkar’s No 2. Sandhu said security forces have decimated LeT's Hajin group. “The security forces would continue anti-militancy operations in the Valley. We are hopeful of restoring peace in Kashmir as soon as possible,” he said. Sandhu further asserted of following the two-pronged strategy of launching armed operations, as well as asking the local militants to surrender and join the mainstream society. Asked how many militants were active in the Valley now, he said the figure would be between 200-220. “Of them 110-120 would be locals and 100 foreign militants”. Speaking on the occasion, J&K DGP S P Vaid said they would request Pakistan to take bodies of the Pakistani militants killed in Hajin gunfight. “As a human being and a police officer, I would like the family members and relatives of the slain militants to have glimpses of their bodies,” he said. In past also, J&K police had asked Pakistan embassy in New Delhi to take bodies of the Pakistani militants killed in the State. However, the Pakistani government has neither owned the Pakistani militants nor claimed their bodies. The DGP said security forces would continue their operations against militants, especially against the foreign militants. Referring to surrender of footballer-turned-militant Majid Khan, Vaid said it is an encouraging trend. “I would like to urge all mothers to appeal their children to leave arms and path of violence and return home,” he said. On the killing of Lakhvi's nephew of in the encounter, Vaid said it is nothing but militant leadership’s bankruptcy. “To motivate their cadres, the commanders are sending their relatives to the State,” he said. Sandhu further added that the commanders are forced to send their relatives to Kashmir front because the militants are questioning them for keep their kins safe and sending them to die in the State.